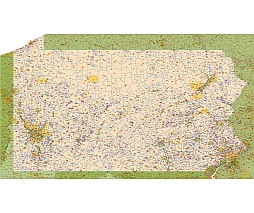 Editable royalty-free map of Pennsylvania, PA in vector-graphic online store. Pennsylvania is a U.S state that is located in the Northeastern and Middle Atlantic regions of the United States. The state borders Delaware and Maryland to the south, West Virginia to the southwest, Ohio to the west, New York and Ontario, Canada, to the north, and New Jersey to the east. Pennsylvania Zip codes vector map 2015. Pennsylvania State vector road map.